There is no longer any excuse for nodding off in an important work meeting, because Greek designers NL Studio have created the first ever work desk that transforms into a full-size bed. 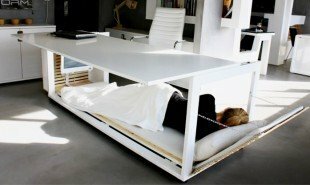 The convertible desk was designed to enable exhausted workers to take power naps that will reenergize them and prevent fatigue. There is much medical evidence in favor of the 20-minute power nap, which has been shown to enhance alertness, memory, creativity and motor learning skills. While large companies such as The Huffington Post and Google are able to accommodate this with dedicated nap rooms and sleeping pods, small businesses, especially in cramped cities such as New York simply don’t have the room. 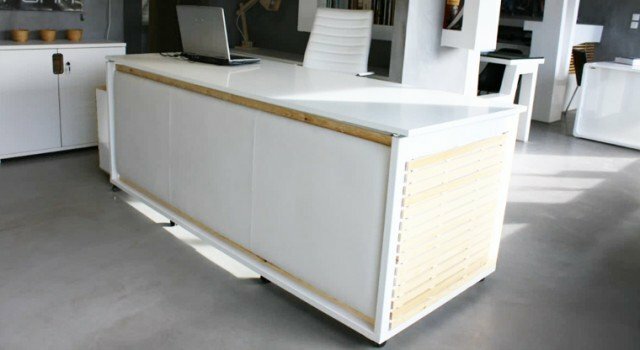 A prototype of the convertible desk, made from wood, white leather and metal, is 2 meters long, making it a much more space-conscious alternative. The desk features a thin mattress on the bottom, a removable back and a flap that open out to create an angled head rest. It even has a computer monitor at one end to enable users who are bedding down for the night over a deadline to watch a show before they go to sleep. NL Studio suggest that the desk could also be used in university libraries, replacing the makeshift beds created by panicked students in the run up to deadlines. We have already seen the Ostrich pillow — a “sleeping bag for the head” — from Madrid help users nap at their desk. What are some other space-efficient ways to let workers in small offices get some Zs? The post Convertible desk for office power naps appeared first on Springwise.